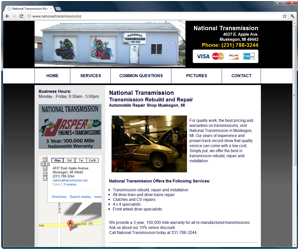 I recently got to do a ground up PHP and HTML build for National Transmission, a transmission repair shop located out Apple Ave in Muskegon, MI. When I initially got to speak with Pat the owner, he told me about wanting a new and more personal website based around his automotive repair shop. See Pat already has one website for the business. It’s a one page website built by yellowbook around National Transmission. 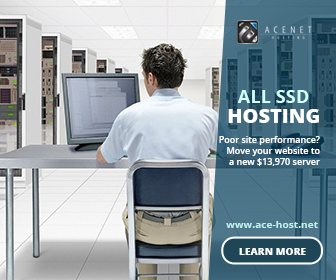 The real problem with this site besides the legitimate art of on page optimization is that it has no pictures of the business, and does not use any pics or the location in the little commercial video they did. It simply looks like a horrible cookie cutter web page that could have been placed around any auto repair shop. When I started the project I got some good pictures of the outside of the building to be utilized on the site. Pat’s building there is actually really great looking and really sticks out as it has some artwork by Muskegon’s own airbrush expert RICO! As with a lot of business sites lately I went with an upper right hand corner name location and phone number. I also went with an indepth contact page that really makes great utilization of the Google map to show you exactely where the business is located. Beyond that there is not much to tell. There was not a lot of need to add original content for SEO as I knew this site, once hooked the the Google business listing would rank him right up where he needs to be. Truth is for a small amount of money and 4 or 5 articles I think I could easily rank him right into #1 for many different search strings right now here in Muskegon. Truth is he’s sitting top 5 for all of them now so he has nothing to worry about. 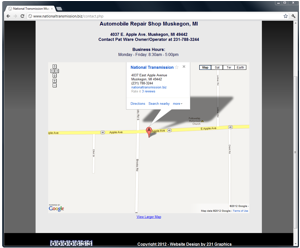 I do recommend you having your vehicle fixed at National Transmission today!!! Visit the National Transmission website today!